The benefits of cooking this soup in the Instant Pot are speed and simplicity. After the initial saute, the soup cooks in only 4 minutes under pressure – before you get too excited, keep in mind it takes about ten minutes before that to build up to operating pressure, so it’s not a huge time savings from the stovetop method (the really mind-blowing time savers that pressure cookers offer involve tougher foods, like meaty roasts or dry beans). But it’s still 30% faster, and completely hands-off and self-contained, freeing up the cook to chop garnishes and fry up the crispy topping. And I apologize for getting this far without mentioning that however you cook it, the stuff is incredibly good. Major crowd-pleasing material. It’s just legit, simple, whole-food ingredients coming together to pack a huge flavor PUNCH. I really like this soup as written, straight up, but it’s also a great baseline recipe for loading up with extra veggies. Top candidates include finely chopped zucchini, bell (or poblano!) peppers, and shredded greens. Add any extra veggies after the onions have had a chance to soften, and if you really stuff the pot full with goodies, just add a little extra broth/water to keep the right consistency. Note that this recipe uses corn tortillas in two capacities. First, little bite-size squares are added to the base along with the vegetables, contributing to the soup’s body and acting as sort-of noodles. Then, the real star of the show: crispy pan-fried tortilla topping. Today I fancied it up with these pretty strips, but to make it even less effort, just leave the tortillas whole for easy flippin’, then break them apart over each bowl. It doesn’t matter if you simmer this or pressure-cook it… just make the soup. Garnish like you mean it. A little fried crunch atop a bowl of undeniable healthy goodness is sometimes just what it takes to elevate your life from good to awww yeah. 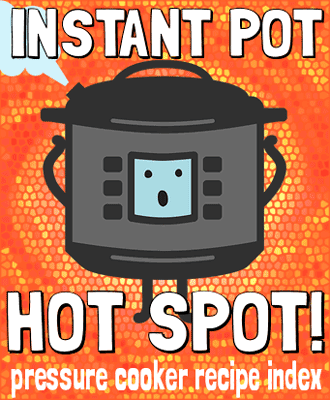 Set Instant Pot to saute mode, medium (default) heat. Add the olive oil and onion and cook, stirring frequently, until softened. At this point, add the garlic, cilantro, and tortilla squares. Stir to combine and cook for one minute longer before adding the tomato, black beans, corn, broth, spices, and chicken breasts. Cancel saute mode, and cover Instant Pot with its lid, set to sealing position. Select Soup Mode and manually adjust the time to 4 minutes. It will take about 10 minutes to reach pressure before the 4-minute countdown begins. This is a good time to prepare the toppings. Heat the frying oil over medium heat in a medium-sized skillet. The oil is hot enough when you can place a tortilla strip in and it immediately starts bubbling. Fry the tortilla strips on both sides until golden brown, then transfer to a paper towel to drain. Lightly salt the tortillas immediately after frying. Grate the cheese, wash and chop the cilantro, and slice lime wedges for serving. After the timer goes off, manually release the pressure (be careful of the steam!). Remove the chicken breasts to a plate and use two forks to shred the meat apart. Return the shredded chicken to the pot and stir to combine. Ladle the soup into bowls and serve with fresh cilantro, a sprinkle of shredded cheese, a squeeze of lime juice, and the crisp tortilla strips. Add the olive oil to a Dutch oven or large pot over medium heat. Add the onion and cook, stirring frequently, until softened. At this point, add the garlic, cilantro, and tortilla squares. Stir to combine and cook for one minute longer before adding the tomato, black beans, corn, broth, spices, and chicken breasts. Increase heat to high to bring the soup to a boil, then reduce heat to low. Let the soup simmer for about 20 minutes. This is a good time to prepare the toppings. Heat the frying oil over medium heat in a medium-sized skillet. The oil is hot enough when you can place a tortilla strip in and it immediately starts bubbling. Fry the tortilla strips on both sides until golden brown, then transfer to a paper towel to drain. Lightly salt the tortillas immediately after frying. Grate the cheese, wash and chop the cilantro, and slice lime wedges for serving. When the chicken breasts are cooked through, remove them to a plate and use two forks to shred the meat apart. Return the shredded chicken to the pot and stir to combine. 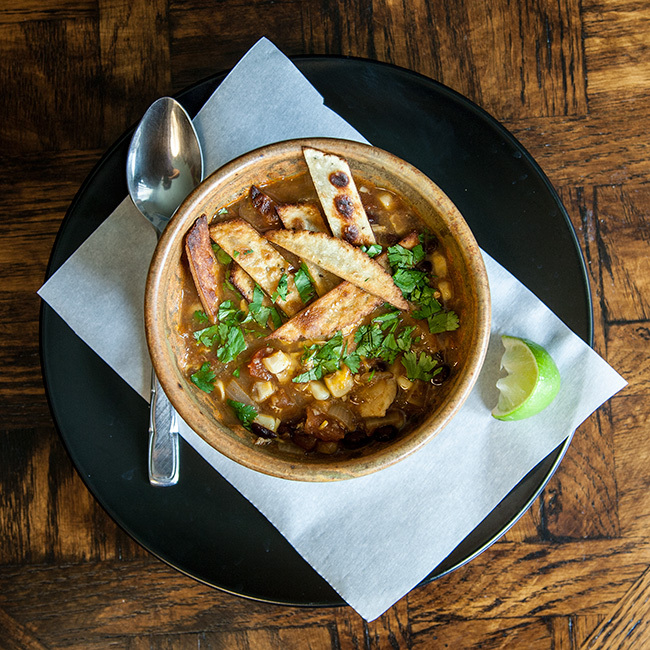 Ladle the soup into bowls and serve with fresh cilantro, a sprinkle of shredded cheese, a squeeze of lime juice, and the crisp tortilla strips. yummy! i think this instant pot was easy to use and very convenient. It’s incredibly good! Tnx for showing this! I love that!! I’m especially intrigued by the shredded cabbage topping, I’m definitely trying that out in my next batch. I never leave a reply on recipes but this recipe is amazing. So easy and the taste is amazing. So flavorful. Restaurant quality. I love my Instapo, this will now become a staple in our home!!! Thank you!!!! The chicken breasts cook in 4 minutes? I’m new to the IP, but most recipes call for more time on chicken. Just want to be sure I’m reading this right! Thanks! It works for me! The chicken breasts cook quickly in the soup as long as they are thawed and small enough (according to the weight in this recipe, mine were only about 4-6 oz.). If yours are larger or frozen, add more time. We use fire roasted corn to change the flavor a little and LOVE leftover rotisserie chicken in it. I have a picky 8 and super picky 13 year old and they both request it. The first batch had 4 leftover servings … gone by noon the next day. Make this recipe! Made this recipe twice in two weeks, will definitely make it again. Love it, so hearty and filling. Made this tonight and will definitely make it again! We used a can of tomatoes and seasoned black beans. Also, since I am vegan, I used GardeIn “chicken”. Cooked it up in a pan and added it after soup was cooked…. This recipe is a definite keeper!!!! Best tortilla soup recipe!!! How many more minutes on the chicken so it shreds better? Thanks! Tough question to answer, because optimal cooking time really depends on the size/thickness of the chicken breasts you use. If yours seemed “just cooked,” and if next time your chicken breasts are about equal in size, try adding 2-minute increments until you get the desired result. I’m curious about the manual release of the pressure. I just want to make sure you mean to pop the valve open so it realeases quickly? I have only made 2 things in my pot, new as well but thought I read that soups should go through natural release so food doesn’t shoot up & get stuck in the valve? Right, I use a “quick release” here – I usually avoid quick release for starchy foods like rice or beans, because the starch can become foamy and that foam can clog the valve… but haven’t had any issues with this soup. I think flour tortillas can get gummy in soup… if I were making it corn-free, I would try leaving out the tortillas and mixing in some cooked brown rice at the end instead! This recipe was delicious even with all my mistakes; Forgot the bay leaf; used 1 small plum tomato and 1 cube chicken stock; no black beans and only 2 chicken breasts. And yet it was so tasty. I will try it again without the cooked tortillas; texture of the cooked tortillas in the liquid was just okay. Thank you so much for sharing this recipe. I’m new to the Imstant Pot and your instructions were excellent for me. I’ve been there!! Live and learn, I only had to make that mistake once 🙂 Glad you liked the soup! In trying this today but using the slow cooker mode on my instant pot… It’s going to be interesting. Are the black bean drained and rinsed? I typically do drain and rinse – need to add that to the recipe, thanks! This was so delicious! My whole family loved it. I used a 15 oz can of diced tomatoes instead of the tomato and it turned out wonderful. Thank you soooo much. Can I safely double this recipe? I have the same instant pot you do. It should be able to fit – just be mindful of the chicken portion so you don’t exceed the maximum-fill line on the IP inner liner. I would also avoid manually releasing the pressure when the pot is that full… stay safe and give it at least 10 minutes to pressure down naturally before carefully testing the valve. I prefer to cook my dried beans separately – I pressure-cook a big batch and freeze in tupperware containers, then thaw as needed to add (already cooked) to recipes like these. 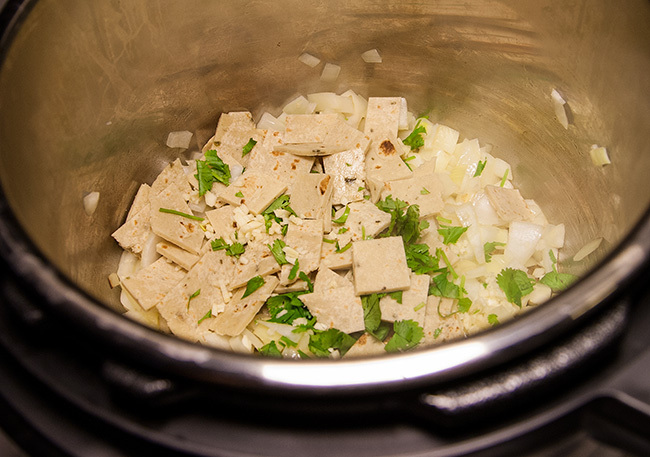 Even though I do not have any corn tortillas, very uncommon for me but hey, it happens, I am making the soup tonight. I am going to put crushed tortilla chips on top when I serve the soup. Won’t be as good but I bet we love it. I am in need of a quick meal and I have all the other ingredients so wish me luck. Haha, of course it will still be good! I just go nuts over the special garnish. Good job making it happen, I’m wishing you luck! Just made this one with my new IP, great recipe and my 11 year old daughter loved it too! How shall I adjust for frozen chicken breasts? This was the first recipe I made in my new instant pot, and it was EPIC. I am from Oklahoma and very picky about my tortilla soup, but this lived up to my expectations!! I had two friends over who are also big mexican eaters and they were like, “whoa you made this in 4 minutes – we need one of these pots!” Excellent recipe! I added a tomatillo for fun 🙂 I can’t wait to try more of your recipes! Thank you so much! Thank you!! Woohoo, glad it worked out so well!! Holy Toledo this is AMAZING! I used frozen chicken so I cooked 12 mins on high pressure, then quick release. Ashley, you cooked the chicken separately for 12 mins or total soup cooking time with the frozen chicken breasts was 12 minutes? Thanks Ashley. Did you cook the chicken separately first or was the 12 minutes total soup cooking time with the frozen chicken added? I cooked the whole soup for 12 minutes. I put the whole package of frozen chicken (one of those 12 oz packs from Costco). I didn’t even put any effort into trying to seperate the peices, just put in the whole thing. I only have thawed chicken thighs. Bone in. Should I add a couple of minutes? Hi Mary, I made this soup in my brand new insta pot( my first recipe) and it was a hit. Everyone in my family loved it! You instructions to use insta pot were excellent!! Thank you!! Just got my instant pot today and have already used it three times! For dinner we had your chicken tortilla soup. It was fabulous. Everyone loved it. Thanks for sharing the recipe. It’s a keeper and I know I will be making it again before too long. If I double this, do I cook longer to allow for the extra chicken to fully cook? Looks yummy! Generally, you can double recipes and use the same cook time. My husband and I just ate this wonderful dish and loved it. Super easy. And now I’m officially in love with my instant pot. Thanks for the great recipe. Do you have an estimate calorie count for a 1 cup serving? I haven’t measured a precise yield for this recipe, so I can’t tell you off-hand per cup – but I figure it at about 200-250 calories for 1/6 of the pot, or ~300-375 if you divide the batch into 4 large servings. Seriously so good!! 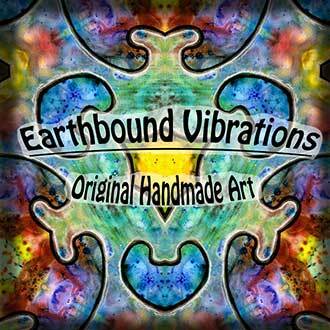 Thsnkyou will be making again!!!! This is my favorite Tortilla Soup Recipe! Looks yummy! Can I use cooked rotisserie chicken? I have a ton of it in my refrigerator ;). Sure! If you’re using cooked chicken, I would just stir it in at the end, after everything else is cooked. Ah! Awesome! Great idea! Thanks so much for this recipe — I’m going to try this soon. Loving my Instant Pot and searching out recipes for it. Okay, I finally got a chance to make this. OMG — yum! 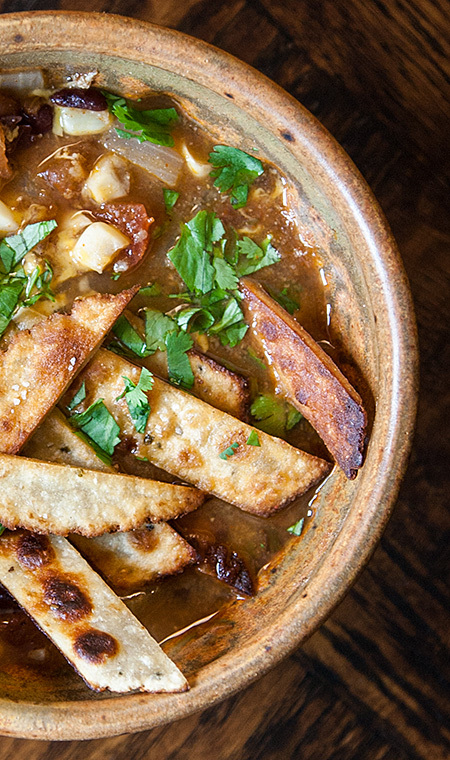 This is the best tortilla soup I have ever eaten. It is restaurant quality…especially when made in the instant pot. This is my new go-to tortilla soup recipe. My husband loved it, too. He told me he can never eat anyone else’s tortilla soup again…that’s saying a lot b/c we live in Houston, TX where there are restaurants galore…and, of course, many, many places to go get tortilla soup. Wow! We are patting our bellies and our tummies are definitely wearing smiley faces! I don’t usually comment a lot on recipes but I had to be sure to comment on this one. The only change I made was to use about 3 tsp of homemade taco seasoning in place of the cilantro (I didn’t have any cilantro on hand and I was not going to the store…;)). And, thanks again for the reply about the rotisserie chicken. I did use it and I did follow your suggestion. Worked beautifully. We buy a lot of it from Costco b/c it makes food prep so much easier. Oh, I forgot to mention that we don’t like black beans too much, so I used pintos :). I’m sure black beans are awesome in this if you like them, but wanted to mention the pintos, too, b/c it works great! Could this be cooked with frozen breasts with more time added? I have not tried this – another comment reported success with frozen chicken breasts at 12 minutes cook time. Time required varies by size of chicken portion (it normally takes me about 20 minutes to cook 8 oz. pieces from frozen when braising in IP). This recipe is totally delicious! Next time I probably won’t bother frying the tortilla chips. I served it with sour cream, too. Sorry… One more question. I made this again tonight (so, so good! )… how big are the servings? My doctor put me on Weight Watchers since the first time I made this and now I’m trying to figure it how many smart points it has 😁. Sorry I missed this comment for so long – I have never measured the total yield volume for this recipe, but I think your easiest option is to figure out how many bowls you get from one pot. I get about 6! I just made this soup and it has fantastic taste. Just wondering if the corn tortilla’s were supposed to cook into the soup to thicken and add taste? Mine are still the squares and I don’t like the mushiness. Thanks again! I love this soup otherwise. Thanks! I consider them “sort of noodles” – but you could certainly leave them out if it’s not your thing. Perhaps this is a case of “guilding a lily” but I make this soup after accumulating (and freezing) excess broths and stocks after using the instant pot to make recipes of Barbacoa, carnitas, and Mexican chicken. As wonderful as the original recipe is, adding these homemade cooking liquids will result in a tortilla soup unlike any you have ever tasted. This recipe is so delicious and easy to make. I stock up on beans, frozen corn and chicken stock and make this quite often. The first time I made this recipe, I used half well rinsed black beans (I’ve never liked them much) and half pinto beans. After realizing the black beans aren’t that bad after all, I now use 1 can black beans and 1 can pinto beans, well rinsed, and it’s delicious. I also throw in a can of rotel tomatoes instead of a fresh tomato. With my ingredients on hand, I just have to buy cilantro, lime, and avocado to make a fresh tasting delicious soup. So easy, tasty, and no one minds eating leftovers the next night or two. Glad you like it! I’ll have to try it with rotel – I’m making another batch of this for dinner right now, and am SO looking forward to the next couple days of leftovers! This is my 3rd recipe ever to try in my IP. My husband licked his bowl. And my picky 7 yr old licked it up too. I about burned myself when crisping the tortillas with flying oil. Next time I’m using chips. We added sour cream to our bowls. To make creamy. But it was good without too. I used can chili pinto beans. Didn’t drain it. Oh man. Sooooo good. Spices are simple and perfect for me. Added salt and pepper that you don’t have listed. But I guess everyone knows it probably needs that. We are hosting a Mexican dinner party soon and I wanted to try some Tortilla Soup recipes and tried yours first. Won’t need to try another! I had to make some substitutions based on the freezer and pantry staples. Don’t laugh…a can of refried black beans instead of just black beans. Its all I had. I liked the thickening that it gave me but its not as healthy as yours. Added some frozen corn and frozen zucchini from last summers garden. Used canned tomatoes instead of fresh. Again, not as good as yours but its what I had. Then added vegetable broth instead of chicken…had to use up what I had in the fridge. For the dinner I’ll come back to your original recipe. Thanks! I made this recipe for dinner tonight – my second instant pot recipe ever. It was so easy to sauté in the pot and it tasted so much fresher than other recipes I’ve used with taco seasoning mix. I’ve hooked! This is delicious and simple to make – one of our regular dinners now! A fun accidental discovery tonight: I had no cilantro but did have guacamole handy, so I mixed a big dollop of guac in before pressure cooking the soup and it tasted really good! We love this soup! So delicious and easy to make! I do think I needs salt, though. Do you add any? If so, how much? Thanks! I do salt it, it just never ends up being the same amount depending on what kind of broth I start from… probably if I was using totally unsalted broth, I would start with a scant teaspoon and taste from there. Sorry, I should keep better notes! No problem. This is very helpful, thanks! I usually use homemade, unsalted broth, which explains why I need to salt the soup. I didn’t think of that. Thanks again! Has anyone used ground chicken in this recipe? How did it work out? If so, any adjustments required? I would probably spend a little time browning the ground chicken together with the onions. Mmm, taco soup! I have an 8 qt and will be trying this this weekend, should I double up on everything as I will be feeding a big crowd? What are the nutritional guidelines on this. I know how many servings I got out of mine but for those of us counting calories it would be helpful. Love this soup! Just analyzed and added info to the recipe notes – hope that helps!